With Kinder Morgan’s plans to expand the Trans Mountain pipeline and bring 300 to 400 tankers a year through the Burrard Inlet, this is an issue that many of us care about. 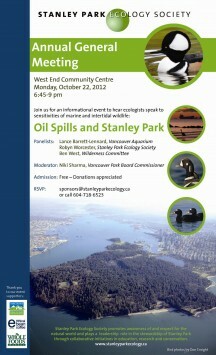 The panelists are: Lance Barrett-Lennard, Senior Marine Mammal Scientist at Vancouver Aquarium, Robyn Worcester, Conservation Programs at Manager Stanley Park Ecology Society, and Ben West, Healthy Communities Campaigner at Western Canada Wilderness Committee. Park Commissioner, Niki Sharma is the moderator. Refreshments are provided, thanks to Whole Foods and ethical bean coffee. The event takes place at the West End Community Center on Monday, October 22, 2012, 6:45-9 pm.